Indonesian cuisine has always been influential in Thai cooking. 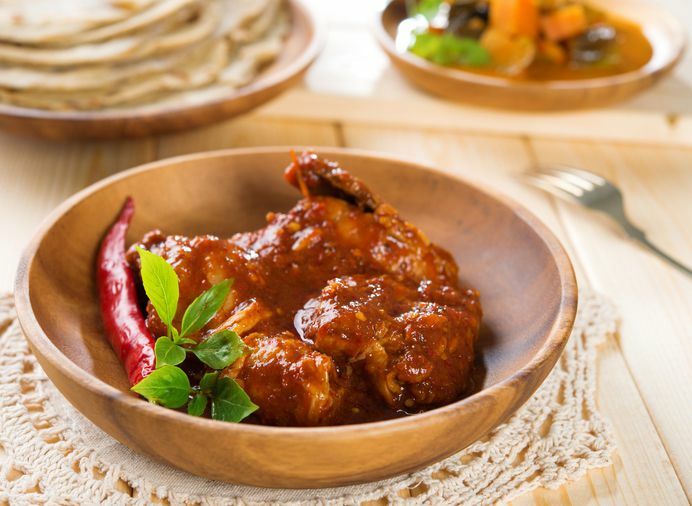 One of the more popular Indonesian dishes in Thailand and throughout Asia is rendang chicken or beef curry. Rendang is considered a "dry" curry, which means the sauce is simmered down to a minimum. Because it is so distilled, the sauce sticks to the meat, making this dish incredibly flavorful. As a bonus, its wide variety of spices makes it extremely healthy. If you like your curry with an abundance of flavor, you'll love rendang. Serve it with Thai jasmine-scented rice or easy Thai coconut rice. This dish can also be served with flatbread. Place all sauce ingredients in a food processor. Process well to form a thick curry paste. If you don't have a food processor, simply chop onion and herbs finely, and combine with the coconut milk, spices, and other ingredients. These herbs and spices can also be ground together with a pestle and mortar. Do a taste test for salt and spice, adding more fish sauce if not salty enough. If not spicy enough, add more fresh chili or chili sauce. If too sour, add a little more brown sugar. Place sauce in a wok or pot over medium-high heat. Add chicken pieces plus the whole star anise, if using, and stir well. Continue stirring occasionally as you bring to a boil. Then reduce heat to a simmer. Do not cover, as you want the sauce to reduce and become thicker. Allow the curry to simmer, stirring occasionally, for up to 1 hour, or until chicken is cooked and tender. The sauce will reduce so that it is almost like a coating on the meat (plus there will be a little sauce leftover in the pan). Serve directly from the wok with any extra sauce poured over. Garnish with a sprinkling of fresh coriander, if desired.